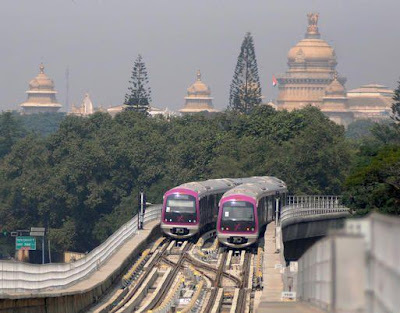 India Outside My Window: The Bangalore metro rolls in –finally! First it was announced for December 2010. Then January 2011. Then February. Then April 4th to coincide with Ugadi, the Kannada New Year. 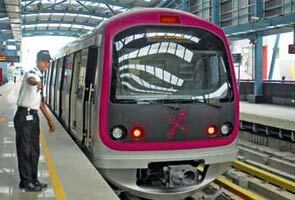 Then nothing more was heard about the very much-anticipated launch of the Bangalore metro. Finally a date was set in September. Which was then moved to October. 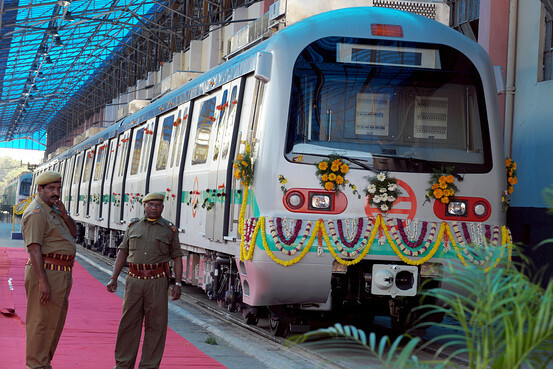 Everyone held their breath, and finally on October 20th, the first phase of Namma Metro (‘Our Metro’) was finally inaugurated. “Have you been on the metro?” is the question that’s been on everyone’s lips for the past week. I took my first trip a few days after the launch. I’ve been waiting impatiently for the metro to become operational because it’s going to make life a lot easier for me since I live in walking distance of one of the stations. The first phase runs for a distance of only 6.7 kilmetres and has just six stops along the route. But the time saved in commuting is significant. Now a trip from Indiranagar to MG Road which would very often take me up to 40 minutes in an auto-rickshaw during peak traffic, takes only 7 minutes. That’s a difference of 33 minutes, which means I can spend those precious minutes doing something more constructive than sitting in an auto-rickshaw or bus and watching the world go by. I took the metro for the first time on a Monday afternoon, just a few days after it opened. It was a working day and the stations and trains weren’t crowded. The second time was on Diwali, a public holiday. This was a whole other experience. The atmosphere was one of a fun fair or amusement park. 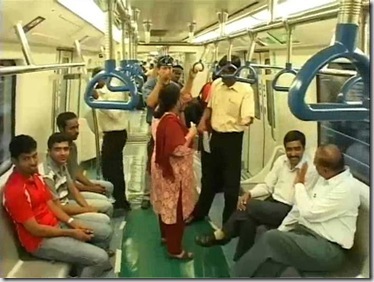 Whole families had showed up, all dressed up in their Diwali finery, ready to test the metro. These were not the ordinary weary commuters you find in metros all over the world. These were revellers ready to celebrate a landmark event. Security is tight, like in most public places in India. The police guard the entrances. 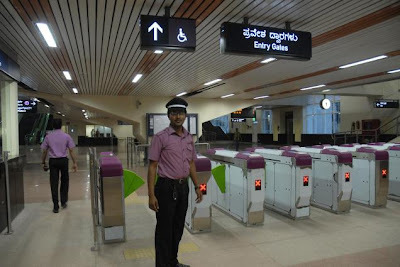 To enter the station you have to pass through a metal detector and bags are checked. At MG Road it took 10 minutes just to enter the station because there was a long line. Then it was time to queue for a ticket which also took time. In exchange for 12 rupees, I got a black electronic token, which is scanned at the electronic turnstile when entering – and deposited in a slot when exiting. By the time the arrival of the train was announced, the platform was crowded. As the train appeared and was pulling into the station, the crowd was teeming with anticipation. Dozens of mobile phones filmed the arrival of the train. A symphony of shrill whistles started up as the guards warned commuters to stay behind the yellow line. As the doors opened, there was a collective cheer as everyone pushed forward, aiming for a seat. Then the doors closed and we were on our way. The noise level inside the carriage was striking. I felt like I was on a school trip. Many of the lucky ones who had got a seat promptly stood up to have a better view of the city’s rooftops going by the window. Cameras were still clicking away as people took pictures of each other taking their first trip on the metro. Each station was announced first in Kannada, then in English, then in Hindi. I remember reading about the Delhi metro when it first opened. The intercom system had failed because so many people were using it to tell the driver to ‘go faster baba!’ But this carriage full of Namma Metro revellers were disciplined despite their obvious school kid excitement. I imagine that over the next few weeks the excitement will wear off and the shiny new car smell will fade. 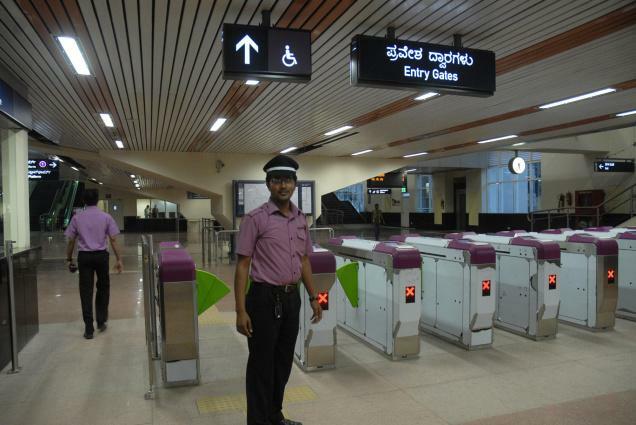 Then Namma Metro users will become the same nonchalant, weary commuters you see the world over. Since my first few trips as a ‘metro tourist’ I have been a commuter, taking the metro to get to places I need to go. Though I don’t really go to the MG Road area that often, I can now find many excuses to take the metro and get off at the last stop. I can finally get a membership at the British Library. I can go to Emgee’s for Neer Dosa. I can go to Church Street to browse in the second-hand bookshops. I can easily walk to Lavelle Road from there. And if I’m travelling somewhere further than MG Road, I can take an auto-rickshaw from there to my destination, avoiding the choking traffic all the way to MG Road. 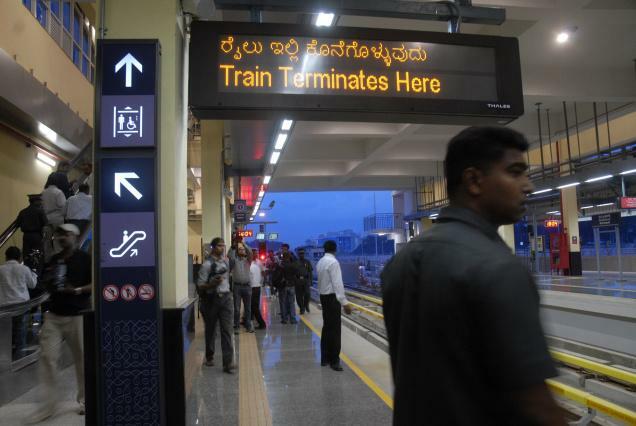 Because now there’s Namma Metro. Above: Only a tiny stretch of the metro is open now. Work is continuing on the other phases. 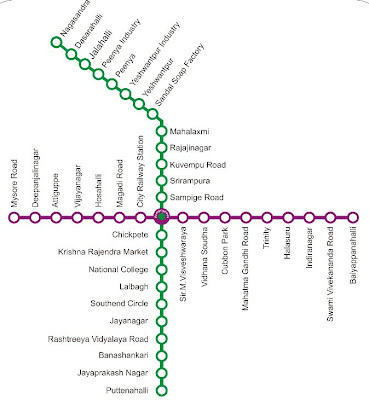 This is what the route map will look like. Couldn't live without the BTS in Bangkok. High time for a growing city like Bangalore. Yay!! Finally I too can hop onto this and be shopping on M.G.Road in a jiffy! Thanks for posting this as I was looking for a review of how it is operating ever since it opened. Now, when I am in India, I don't have to waste time on the streets of Bangalore at least to get to some of my shopping. Yes the metro has certainly made commuting through one part of the city much easier!